Volkswagen’s Jetta was restyled for 2019. 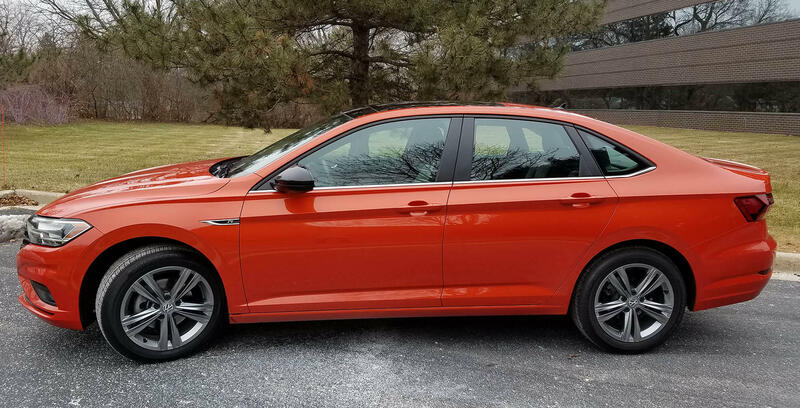 Oh yeah, and the R-Line lists at just $23,845 (including delivery) and that includes everything a person who enjoys driving will want — except maybe its retina-burning color, a bright reddish-orange VW calls Habanero Orange Metallic. But even that only adds $295 to the sticker. And get this, the new Jetta is bigger and better equipped than its predecessor. In fact, VW has been improving Jettas for a while. This is the seventh generation Jetta, a nameplate that has been around now for 40 years. Its longevity says something about its staying power in a market where new and trendy is almost like adding another G in the cell phone world. 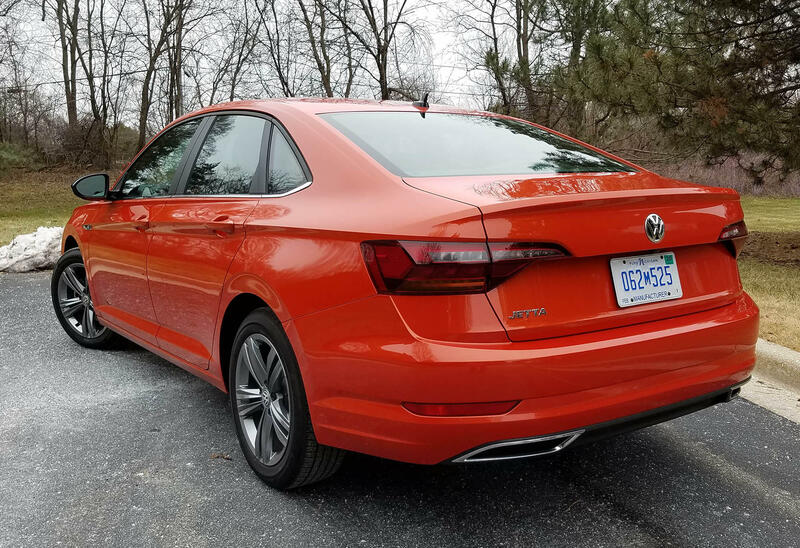 Jetta now rides on a 105.7-inch wheelbase (1.3 inches longer than before) and the car is 185.1 inches long - nearly 2 inches longer overall. Much of that went into the roomy back seat, yet the trunk remains a sizeable 14.1 cubic feet - all very practical. Yet once you press the conveniently located start button on the console, practicality seems to disappear as quickly as an email from your mom. Handling is superb. It’s light, fun, and precise. At just 2,970 pounds, the Jetta sits light on its 17-inch wheels and tires. It turns into corners crisply and with an exuberance rarely found in cars starting at less than $40,000. "It turns into corners crisply and with an exuberance rarely found in cars starting at less than $40,000." Power is strong and comes on fast with the 1.4-liter turbocharged I4 under Jetta’s hood. This creates 147 horsepower, which certainly won’t out gun many vehicles, but the torque is rated at 184 pound-feet which gives Jetta an excellent power to weight ratio. The result? Snappy acceleration, which would be even more fun with a manual gearbox, but that’s only available in the base S model. In the R-Line and other trims, the power runs through an 8-speed automatic that seems incredibly smooth and well mated with the turbo I4. That 8-speed aims to aid power but also save you gas. This Jetta is rated at 30 mpg city and 40 mpg highway by the EPA. I got 33.4 mpg in about 60 percent city driving, while in a previous Jetta drive during warm weather I managed 38.2 mpg. The ride remains firm, but tamer than previous Jettas I’ve tested. That longer wheelbase seems to calm it enough to be pleasant for most riders. It’s certainly sporty and well controlled, which also aids the sedan’s handling. Ironically VW went away from the newer multi-link rear suspension to a torsion beam version that actually seems better on our rough Midwest roads. However, back seat riders feel the bumps more than folks up front. The R-Line touts 17-inch wheels and tires as opposed to the standard 16-inchers on lower trim levels. Those tires coupled with VW’s fine four-wheel disc brakes also give Jetta excellent stopping power. Stability control is standard as is an electronic differential lock, plus an intelligent crash response system that calls for help if there is an accident. Other safety features include a backup camera, blind-spot warning system, rear-traffic alert, and forward collision warning with automatic braking. Remember, this is a low-cost sedan, not a high-priced techno-mobile, so there’s no lane departure warning (a blessing in disguise as there was no incessant beeping or autonomous wheel adjustments while I drove this car). I was in control and could drive as conditions dictated, what a hoot! 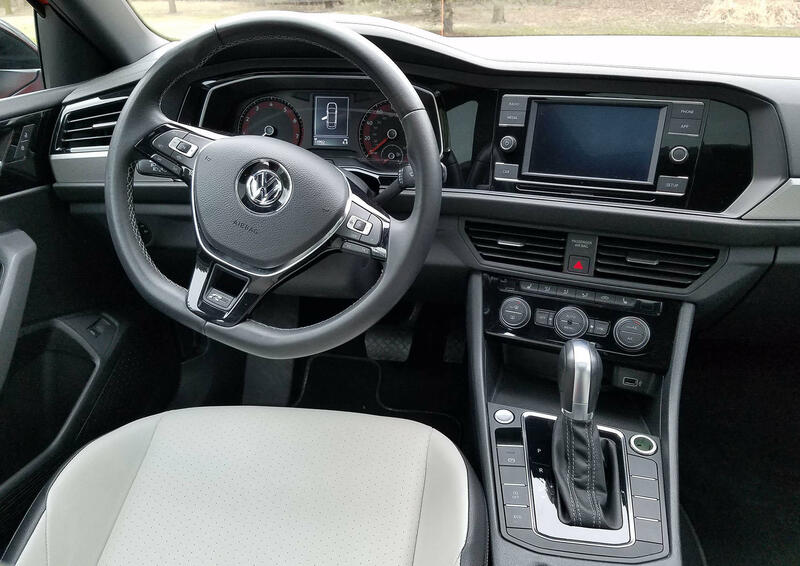 Inside, Jetta is much quieter than most entry-level cars and is well laid out and equipped. The metallic orange test car featured off-white perforated leatherette seats. That’s fake leather more akin to vinyl, but they look fine. The dash and doors were black, as was the headliner. Trim was a metallic herringbone pattern that also extends into the doors. The console was flat black with gloss black trim surrounding the infotainment screen. One downside is the hard seats, and everyone who rode in the VW commented on their stiffness. I found them comfortable as they are just mildly contoured, but their firmness could become an issue on a long drive. Seats were manual with a pump handle on the side to adjust height. Sadly there was no adjustable lumbar support (another concern for long drives) yet the front seats had three levels of heating. The dash is simple and the steering wheel a sporty D-shaped model to reflect the R-Line’s performance emphasis. I also liked the info screen, which is 6.5 inches. A larger screen would be nice, but it was easy to tune and use while driving, including channel select buttons on the screen. That said, the screen is not sensitive enough to engage while wearing gloves. Overhead the sun visors slide and there’s a sunroof too, but with a mesh shade. Solid shades are better in summer to keep out heat and extraneous light. Other interior pluses included a manual tilt/telescope steering wheel with cruise control, trip computer controls and other functions on the hub. As a value-oriented model, the cruise is standard and not a smart system that adjusts to traffic flow. 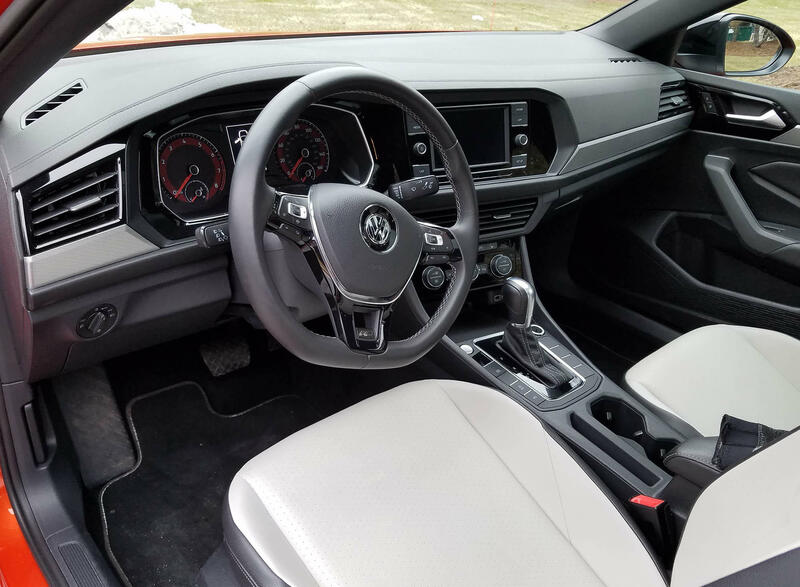 The Jetta does include power mirrors and an inside trunk release, and the rear seats split and fold down to boost cargo space, which already is generous for a small sedan. A Beats audio system is standard on the R-Line, as is a unique grille and black exterior mirrors to help distinguish it from other Jetta trims. Apple CarPlay and Android Auto also come on all Jetta trims, so you can plug in your phone for music or navigation. Best yet, for only $24,140 you can land a car that’s fun to drive, has fine gas mileage, has room for four adults and a trunk big enough to handle a trip’s luggage. Give it a test drive. This may be one of the most underrated car bargains on the road. Hits: Nimble handling, good power and handsome exterior. Quiet interior, simple dash layout, good info screen, heated seats, D-shaped steering wheel, sunroof, plus solid safety equipment. Good mpg. Misses: Firm ride and firm vinyl-feel seats, manually adjusted and no adjustable lumbar support. Mesh instead of solid sunroof shade. What Is Today's Family Car? In December, automotive contributors Mark Savage and Dan Harmon discussed automakers pulling out of the sedan market. Thankfully, for people who do need small, medium, and large size cars, there are still plenty of makes and models to choose from. But what ever happened to the family car? The car that defined the American middle class for a long time: the station wagon, complete with faux-wood paneling and a rooftop luggage rack chugging along the highway. One science and technology area expected to keep rolling toward reality this year is driverless cars (also known as autonomous vehicles). But industry experts say much work is needed before we see many such vehicles in Southeastern Wisconsin. Still, a lot of time and money are being spent on the concept, including elsewhere in the Midwest.